This fascinating description of the Victorian home is just the kind of book I love, filled with detail about ordinary people's lives during the nineteenth century. Bill Bryson referenced it in his excellent At Home, and I'm glad I was able to find a copy at my local library. 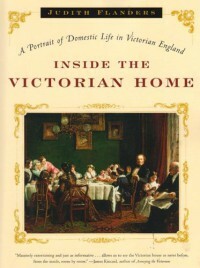 Although, I must say, as the book focused on the home it also focused on the lives of Victorian women, and that was somewhat depressing/shocking. Sure, everyone knows women couldn't own property or have custody of their children after a divorce, but who realizes that they weren't supposed to tell their husbands when their children were sick or eat spicy foods? And one really has to feel bad for the children who were dressed in what sounds like 70 pounds of clothes and supposed to be mostly segregated from their parents. Read it and be glad you live in modern times.